Here is a question with an answer similar to what it is for non conventional oil : non conventional gas is any gas that is something else than… conventional gas ! Conventional gas corresponds to gas that has followed an “ordinary path” regarding its origin : it was formed in a mother rock, migrated, and accumulated in a reservoir rock where it can be associated with oil and water (but not necessarily, when going deep enough there are dry gas reservoirs for geological reasons). It is produced – that is extracted – like oil, by drilling holes in the reservoir rock and bringing back the gas to the surface, mainly under the pressure of the gas remaining in the reservoir rock. gas located in aquifers (with lots of water and no oil !). Sometimes this category also includes gas produced in polar regions, and… methane hydrates. Producing non conventional gas has many similarites with producing conventional gas: the name of the game is to drill a well in the rock (or coal) where the gas lies, and to bring it back to the surface under the pressure of the gas remaining in the rock. The significant differences with conventional gas lie whithin the techniques used underground (fracking), the flow rate, the lifetime of wells, and their cost. Coal bed methane – or CBM – has been known for a very long time, and actually since the beginning of coal production, since this methane enclosed in the coal is a major cause of mining accidents (this methane escapes from the coal seam, mixes in detonating proportions with the air inside the galeries of the mine, and any spark – coming from a machine, a steel tool hitting a stone… – ignites the mixture that then explodes). The presence of methane in coal is normal, as a result of formation of coal. Part of this methane remains “sticked to” (adsorbed) the coal ; on average a tonne of coal contains 4 m3 of methane. In most cases, it will require more energy to free this methane from the coal than the burning of the corresponding methane will yield, so that we do not have a reserve. For 90% – roughly – of existing coal, porosity (size of little holes inside the coal) and permeability (communication between pores) are too low for the gas to “escape” easily enough to allow commercial exploitation. But in some cases, this gas can leave the coal in significant amounts. This possibility has first been witnessed by “accident” in the US, when some oil producers noticed that when an oil well went through a coal seam, there were significant methane bursts going up the well. The reason why it happened so was that these coal seams had been microfracturated by tectonics, what eased a lot methane circulation inside the seam, and this methane went to the surface with the well created for oil. and at last gas is brought back to the surface through the same well. This industry first developped into the US, and now coal bed methane represents 5% to 10% of US gas production. Attemps to produce CBM have been performed in many other places (France, Poland, Russia, China…) but the US are the only country known to have a significant production so far. Australia is though probably going to have a significant CBM production also. Coal bed methane in place is proportional to coal in place, but most of it will never be produced because of the energetic barrier mentionned above (freeing the methane from the coal requires more energy then what burning the methane produced will yiels). Contrary to what happens with a conventional gas production well, a coal bed methane well has a very short lifetime: production peaks within 1 to 3 years, with a sharp decrease following (after 5 years production can have been divided tenfold), and a residual plateau that can last 20 ans, at roughly one tenth of the initial level. In order to maintain a given production it is therefore necessary to permanently drill new wells, which is done or not depending on the pric of gas at the moment. “Tight gas” is close to conventional gas (it is gas that went through secondary migration), the major difference being that the reservoir rock has very small pores and/or lost its permeability because of a geological action that cemented the pores. Therefore, even after fracking there is a lot of “friction” inside the reservoir rock when producing this gas, and flow rates are limited. A consequence is that producing this gas requires to drill wells pretty close one to another. 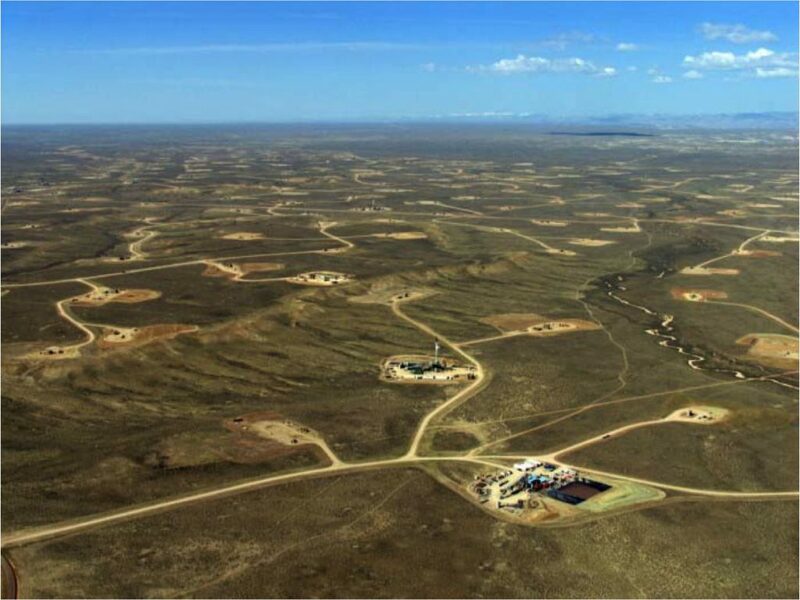 Aerial view of a tight gas production in the US. It is this type of gas – and not shale gas – that is the dominant component of non conventional gas production in the US right now. 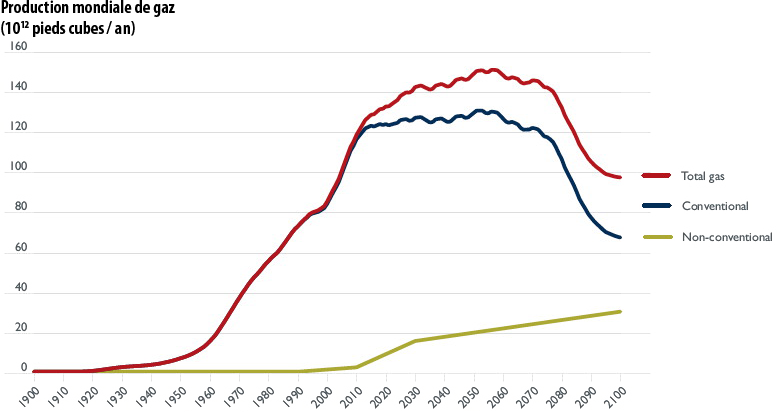 Non conventional gas production in the US, in billion cubic meters per year, depending on the type of gas, and forecast to 2020. “Shale gas” production is forecast to remain notably inferior to tight gas production at that time horizon, in spite of “tremendous amounts” of gas in place. It is also tight gas that is presently developped in China. As this gas is produced with wells that drain a limited volume, even though they are horizontal wells (the drained volume is the volume that has been fracked, and fracking does not extent beyond several hundred meters from the well), the flow of a given well decreases very fast. General profile of the production of a tight gas or shale gas individual well. The vertical axis is graduated in % of the production of the first year, and the horizontal axis is graduated in years of production. After 3 years the remaining production is a small fraction of the past production. To maintain a constant – and even more growing – gas production from a given zone it is therefore necessary to drill new wells all the time. “Shale gas” is gas that never left the mother rock where it was formed (a shale most of the time). For the time being, only Northern America – and mostly US – has been explored for this kind of resource (any assessment for another region of the world is therefore highly speculative), and very large amounts of “gas in place” have been found. But… geologists already know that the extraction ratio will be very low. First of all the proportion of gas in the rock depends directely on the fraction of organic matter in the sediment that led to the mother rock, which can be very variable, and when it was too low the proportion of gas in the rock is too low also to envision any kind of production. Extracting the gas would require more energy than what the gas would yield. It can also happen that gas has been created in significant amounts in the mother rock, but then… migrated and is not there any more ! For all these reasons, it is almost impossible to know what is the proportion of gas in the mother rock without drilling a number of exploration wells. Even when the proportion of gas is significant, shales are compact rocks with low permeability, which also hinders an easy circulation of the gas in the rock. As a result, the recoverable amounts of shale gas are calculated by multiplying figures close to ∞ (gas in place) by something close to 0 (extraction ratio), which makes it difficult to calculate reserves. 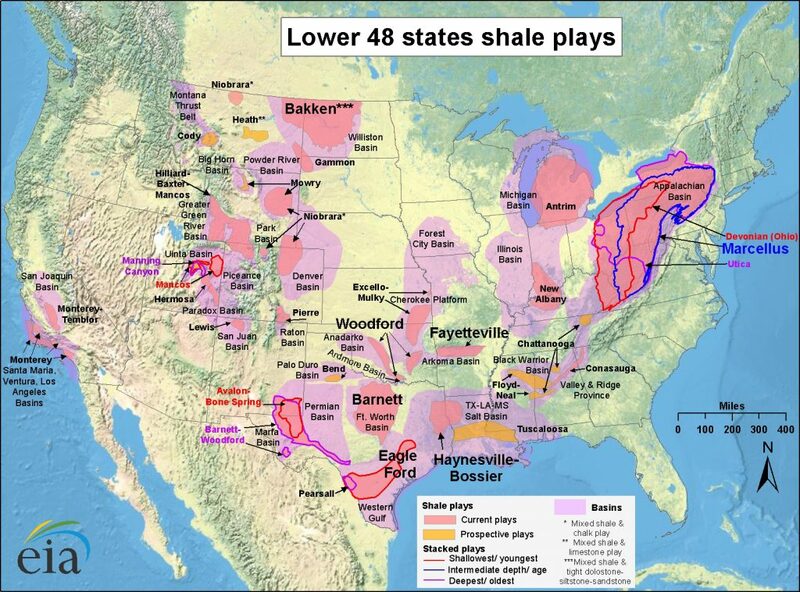 Shale gas resources in the US. and at last be in a country where you do not need a new administrative authorization for every well you have to drill, otherwise you can’t proceed at the “right” speed. All the conditions above are fulfilled for the US, including the last one, since the owner of the land can drill as he wishes within the borders of his property. But elswhere in the world it is not the case: in any other country, an oil and gas company must ask for a licence to drill even when it has bought the land which is over the field. All the conditions above explain why the annual flow you can get out of given resources is much lower for non conventional gas (or oil) than for conventional one. 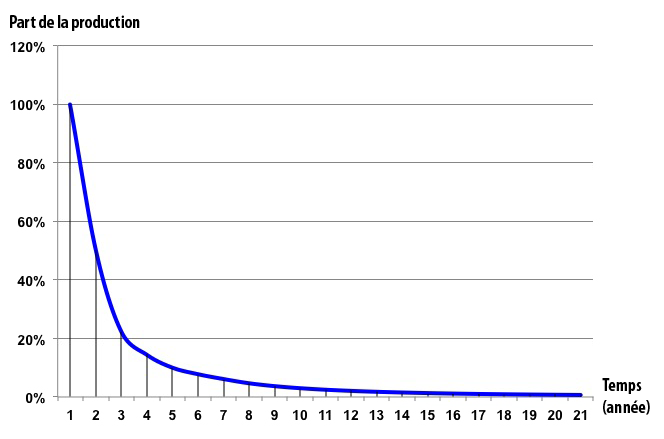 In the latter, the maximum annual output can be close to 10% of the ultimate reserves of the field. For non conventional gas, the ratio is several times lower. It also explains why it is risky to extrapolate to the whole world what has happened in the US, that gather all the conditions (a large industry, a facilitating legal context, an existing network of pipes, etc) to enable a rapidly rising production. Non conventional gas now contributes to about 50% of the gas production in the US, and it is tight gas that accounts for more than half in this category. And the US produces about 20% of the world total (Russia coming second with 17%). 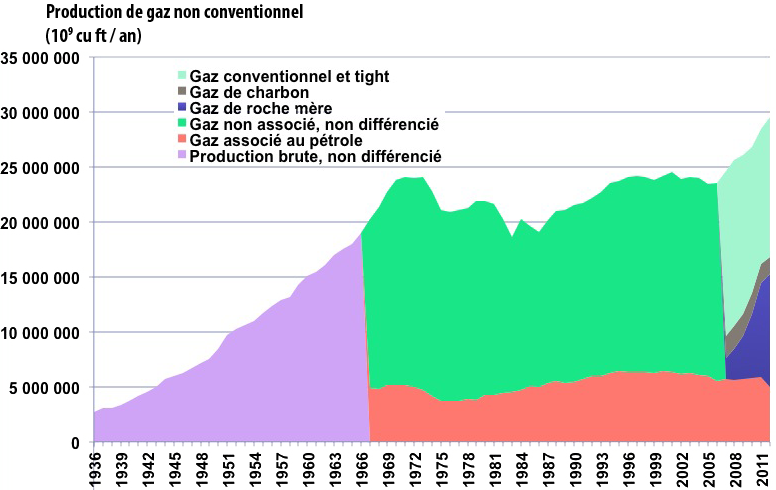 Non conventional gas therefore represents about 10% of the world total. For how long ? The order of magnitude often heard regarding non conventional gas reserves is that they amount to the equivalent of those of conventional gas in the US. It would then add 4% to the world reserves. It won’t change future gas production by a factor two on the world level. But, as gas industry depends even more than oil on fixed costs (particularly for transport), this production surplus in the US radically changed the price for imported liquefied gas (international trade under the form of GNL represented about 10% of the world production in 2011). 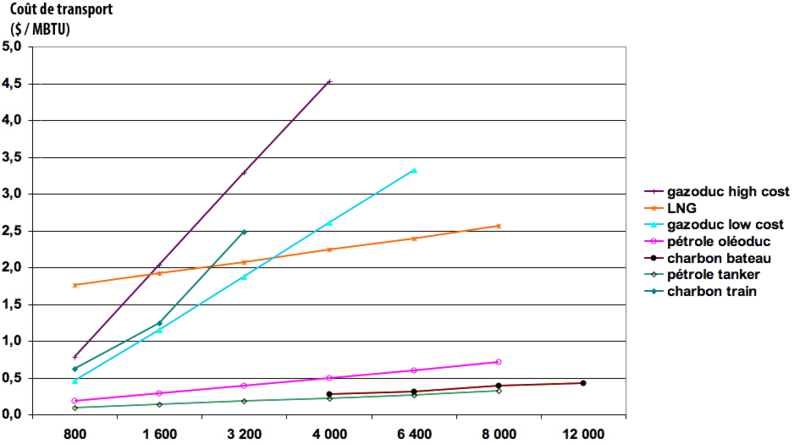 Order of magnitude of transportation costs of various fossil fuels, in dollars per million British Thermal Units, depending on the length in km (horizontal axis, but notice that intervals are not equal). 1 million de BTU ≈ 1 gigajoule ≈ 290 kWh. LNG means Liquefied Natural Gas, that is gas liquefied in a special plant close to the production facility, then boarded onto a ship and brought back to gaseous conditions in the importing country. It is easy to see that gas is the most expensive energy to transport on sea, and also the most expensive to transport inland for short distances (for long it becomes coal). As a result of this high transportation cost, an increase of gas production in a given continent (for example Australia) does not necessarily induces a massive change of volumes and prices in another one (for example Europe). Non conventional gases are therefore susceptible to significatively change a regional context for a couple decades, but on the world level, and over a century, the change should be much more minor. Simulation of the world gas production, in thousand billion cubic feet per year (150,000 thousand billion cubic feet ≈ 4000 thousand billion cubic metres), with a distinction between conventional and non conventional gas. We see that non conventional gas allows to envision a maximum output 15% higher than with conventional gas, even though it would represent almost 50% of the world total by 2100. This extra gas will essentially be located in countries detaining non conventional reservoirs.